HJ: The minerals that makeup crystals are literally stardust transformed over timescales unimaginable to the human mind. As such, they have some pretty remarkable healing properties. There are literally thousands of different varieties, each with their own effects and unique makeup. Judy Hall is one of the world’s foremost experts on crystals and presents a wonderfully detailed and complete guide below how to use them for healing your mind, body and spirit. Excerpted from Earth Blessings: Using Crystals for Personal Energy Clearing, Earth Healing & Environmental Enhancement by Judy Hall, a past-life therapist and karmic astrologer with more than 40 years of experience. Crystals and the rocks that enfold them are reborn star matter, created and recreated by a variety of processes, each of which affects how energy is able to flow. Some crystals solidified from gases, others dripped into being and some were ground up and reformed in layers. A few were created so fast they lack internal crystalline structure. The rock on which you live, or on which a building or a sacred site is situated, has a profound effect on how energy moves through the Earth and on your physiology. Psychogeology, the effect of geology on the mind, suggests that it may also have an effect on how you feel and experience life. Planet Earth evolved from clouds of gases containing the minerals that constitute all life and matter on this planet. The cloud slowly condensed to form a fiery spherical globe. As this body began to cool, crystals and rocks came to life, conceived from the minerals and magma that lie between the central core and the crust. Magma—molten lava—constitutes the majority of our planet, the solidified crust of the globe being only as thin as the skin of an apple. Some minerals collected in the crust to form pockets of crystal, while others hardened into rock. Continuing processes transformed the ancient rocks. Quartz produces electromagnetic energy fields that amplify the Earth’s natural energy currents. Rocks with a high Quartz content (granite, sandstone and quartzite) or metallic mineralogy (iron, copper, silver, gold) attract, conduct and amplify telluric (Earth) energies creating what are known as conductive energy fields. For example, dome-shaped outcrops of granitic and sandstone conduct a synergized telluric energy in oscillating spiral patterns that culminate at the summit of the dome. Channels of rock curve sinuously around the world conveying energy. The current from Pink Granite from Aswan, Egypt, the most powerfully paramagnetic of all granites, dips under the ocean to reappear in Galveston, USA, and wend its way through the state of Texas. It shows itself once again in India in a gentler pink form—but the energy remains just as powerful. Primary creations formed out of the seed material of the universe and the magma of the planet, igneous rocks are the oldest rocks of all. They are also the youngest, as the process continues today. Formed when the minerals in the primeval cosmic gaseous dust cloud condensed, or when molten lava exploded or bubbled through the Earth’s crust, igneous rocks reflect the internal tensions of the globe. Holding raw primal power, the stressful process of creation imparts a powerful resonance that helps to restore stability after change and to ground energies. But first these rocks impel that change to take place, stimulating growth processes and helping to heal the past. Granite and basalt are among the igneous rocks that transmit powerful geomagnetic currents rapidly around the world. Many potent healing crystals are a result of igneous processes. When lava was expelled through faults in the Earth’s crust and cooled rapidly, it created crystals such as Basalt and the Jaspers. Where the liquid magma rose up into the crust and cooled slowly in a “lake,” it formed Rose Quartz and Peridot. Gaseous magma under high pressure permeated hollow rocks to create Amethyst, Tourmaline and Smoky Quartz. Aragonite, a potent Earth healer, cooled slowly in hidden vents into beautiful shapes and colours. 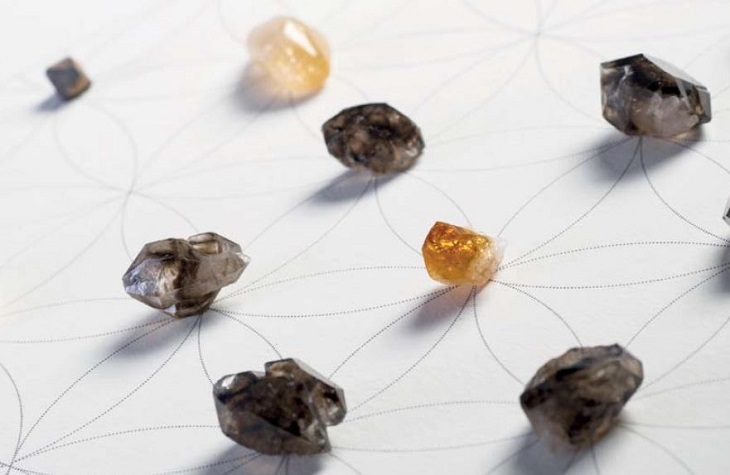 Granite, Basalt and Smoky Quartz are particularly useful for anchoring layouts into the Earth and repairing the Earth’s electromagnetic grid. These are secondary rocks created from particles compressed and cemented together in layers or mixed with rainwater and dripped into being. Such particles may be the eroded remains of former igneous rock or the detritus of sea and other organic matter. Sedimentary rocks such as Limestone and Chalk are fluid and patient, allowing energy to penetrate freely. They’ve seen it all before and resonate with the cycles of death, decay and rebirth. However, the more claggy clays and heavy sandstones can stall energy, slowing it down, while Flint directs and grounds it along precise channels. Rhodochrosite was created through the oxidization of manganese. Stromatolite formed from alternating layers of cyanobacteria and sedimentary grains on the floor of an ocean. Recycled mineral-laden water dripped into fissures to create Selenite. These light-bearing, calming crystals assist with survival issues and riding out long cycles of time. They help you to understand the impact of your environment on your health and well-being and to let go of rigid belief patterns. These are the rocks of transformation, associated with the process of mountain-building and shape-shifting as the plates of the planet push together. They were dramatically redefined when intense pressure, heat and chemical processes modified existing rock. Laid down into recrystallized plates, which in turn could be folded and bent, some of the most potent transformation crystals are found in metamorphic rocks. Metamorphic crystals include Serpentine and Jade. They help you to accept the need for change and transmutation in your life, especially the shaping and scouring that facilitates soul growth. The most common crystal, Quartz is the bones and brain cells of Mother Earth and the Quartz family contains some of the highest vibration crystals yet known. Quartz may be found in metamorphic rocks but is not a result of the metamorphic process. Quartz was formed when fiery gases given off by igneous processes in the magma cooled and solidified, or were heated or dripped upon and continued to grow. Its highly organized internal crystal lattice not only efficiently passes energy through itself, but generates and stores it as well, making Quartz useful for slow-release healing. The speed of cooling and the minerals incorporated into the process dictate the specific shape and precise form that the Quartz, or any other crystal, takes. A crystal is defined by its internal structure—an orderly, repeating atomic lattice. Owing to chemical impurities, radiation, Earth and solar emissions, and the exact means of their formation, each type of crystal has its own specific energy signature and lattice. A crystal is symmetrical along an axis. Each matching pair of faces in the lattice has exactly the same angles. The internal structure of any crystalline formation is constant and unchanging. It is this alignment that allows energy to pass through a crystal and resonate with the energy fields that surround it. While a number of crystals may form out of the same mineral or combination of minerals, each type crystallizes out differently. It is theinternal geometry of a crystal, not the external shape, that determines the crystal’s type and action. It’s tempting to rush straight into the healing work, but you can make your crystal experience much more productive if you look at the basics first. For example, crystals carry the energy of everyone who touches them, so many draw off toxic vibes and all require regular cleansing. Crystals want to cooperate with you, so setting an intention is vital. And, finally, there is one small secret—palm chakras—that makes your crystal work so much more potent. There are a number of ways in which you can choose your crystals—see dowsing and opening the palm chakras later in this chapter. Intuition is another way: simply pick up the one that feels right to you. You may also find that your hands or feet tingle when you pass your palm over or hold the right crystal, or that one sticks to your hand when you run your fingers through a tub. There is no one crystal perfect for any of the exercises in this book, there is only the crystal that is right for you to work with at that moment. Working with focused intention and unconditional love really amps up crystal energies and makes best use of their potential. Simply hold the crystal for a few moments before commencing work and state your intention. Phrasing your intention in the now is much more potent than projecting it into the future. Say “my intention is that so and so happens”—not “will happen,” which pushes your intention into a future that may not manifest. When placing your crystals, do so with love and a clear intention. Before beginning your crystal work, and after it is finished, you need to cleanse your crystals as they quickly pick up negative energies. Their energies may have been damaged by the means of their collection. Mining through blasting shocks their etheric body just as it would ours. Spending time helping your crystals to settle down and restore their energy when you first acquire them is a prerequisite to them being fully available for healing work. Cleanse them, place them on an already regenerated Quartz or Carnelian, leave them out in the sun or under the moon, and give them time to recover. Tell them how special they are, how much you appreciate being a caretaker for them, and ask them to join you in the important work of Earth healing—beginning with their own birthplace. If they are badly shocked, a proprietary crystal recharger (visit here or here) can be helpful. If the crystal is not friable, soluble or layered, you can cleanse it simply by placing it under running water—although preferably not tap water—for a few moments. Dry the crystal and place it in the sun if it has been depleted or shocked. 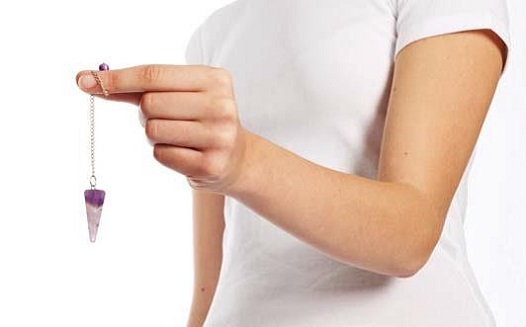 Or, you can add a drop or two of proprietary crystal cleanser to a spray bottle of spring water and spray the crystal lightly with this—this works for friable and soluble crystals, too. Alternatively, place the crystal overnight in uncooked brown rice. As salt can damage friable or layered crystals it is better avoided as a cleansing agent but you could place the crystal in a bag with several pieces of Halite overnight. Smoky Quartz also cleanses crystal energies, but the Quartz itself requires cleansing in due course. The sun recharges a crystal as does placing it on a large Quartz or Citrine cluster, but you can also use a proprietary recharger. How do I know when the healing is complete? You need to establish your own signals—and could finger dowse for this. You’ll probably find that you feel a rush of energy while the healing is taking place and that this rush gradually subsides or suddenly cuts off as the healing is complete. Once the flow of energy stops, remove the crystals—or leave them in place if you’re doing Earth healing through direct placement or on a map. Remember to cleanse them when the work is done. The specific pattern in which you place your crystals is called a layout. These can be either geometrically closed layouts, such as a Pentangle (see above), or radiating layouts, such as a Sunburst (see below). Dowsing establishes exactly where a crystal should go in a layout or a space, or on a map. It also helps select the right crystals. If you’re looking for an energy line in a space, dowsing rods will twitch and cross as you find the line. You can also “body dowse” with your palm chakras or the bottom of your feet—your body tingles as though a current is running up your arms or legs. » Hold your pendulum with the chain wrapped loosely around your hand and about a hand’s breadth of chain hanging down. » To establish “yes” and “no,” hold the pendulum over your knee and ask: “Is [state your name] my name?” The pendulum swings in a circle (note direction of swing) or backward and forward. This is your yes. Repeat using a false name, this is your no. For a “maybe”, the pendulum may shimmy a little or move sluggishly. » Loop the thumb and first finger of one hand together. » Place the thumb and finger of the other hand through the loop and close. » Ask your question and pull firmly. If the loop holds the answer is yes; if it pulls apart the answer is no. » Hold the rods loosely, one in each hand pointing forward. Step forward slowly. The rods swing inward and cross over or outward as you reach a vortex or energy line. With practice, you can use your yes and no movements to establish whether you have reached an Earth energy or a water line, and so on. The palm chakras are energy centres in the palms of your hands. Opening them enables you to sensecrystal energies and to channel healing. Like all chakras, the palm chakras both receive energy and radiate it out. When these chakras are open, you absorb energy from the universe, the Earth or your crystals. This energy flows into your energy field and you can channel it out again as appropriate. The chakras lie in the centre of your palms, but the energy radiates out to your fingertips as well as up your arms. When the palm chakras are open and active, it is as though there’s a ball of pulsating energy between your palms. Keeping your fingers loosely bent, put your fingertips together, palms facing, heels of your hands apart. State your intention to open the palm chakras. Then, “rock” each hand so that first your heels touch (fingertips separate), then your fingertips come back together (and your heels separate). Repeat this rocking motion five or six times. Move your hands away from each other and focus your attention on your right palm and then your left. (Or, left then right if you are left-handed.) Picture the chakras opening like petals, and becoming hot and energized. When you have finished your crystal work, wash your hands or fold your fingers inward to close the palm chakras. » Cleanse your crystals before and after use, and also cleanse the space around them. Do not blow on crystals to cleanse them as your energies may not be pure. Use spring water or a proprietary crystal cleanser. » Ask permission from guardians and higher beings before placing a layout, especially at or near sacred sites. Create your layout in harmony with the Earth’s needs, not those of your ego. 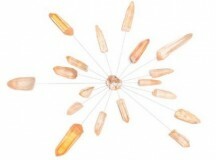 » Dowse or ask for the highest possible guidance as to which crystals are suitable for a particular layout. 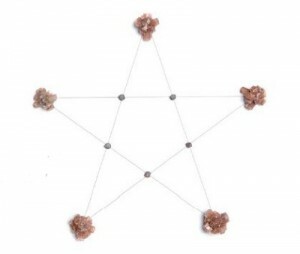 Circumstances change with each layout and the person placing the crystals. » Layouts pick up and amplify negativity, so avoid idle chatter or toxic thoughts; remain positive. » Once you have released a toxic energy, do not speak of it again. To do so re-anchors it, making your work pointless. » Deconstruct layouts when your work is complete, or hold the intention that only that which is for the highest good remains. Crystal points channel energy in the direction they face. Open your palm chakras and hold the pointed end of a crystal on your palm. Feel the energies radiating into you. Lay the crystal flat and turn the point towards your wrist. Feel the energy flow up your arm. Turn it away from you and sense the flow change. Crystal clusters radiate energy in all directions at once. Judy Hall is a successful Mind-Body-Spirit author with more than 40 books to her credit, including the million-selling Crystal Bible (volumes 1 and 2). She has been a past life therapist and karmic astrologer for more than 40 years. An internationally known author, psychic, healer, broadcaster and workshop leader, her books have been translated into 15 languages. She recently appeared in the Watkins Review of the 100 most spiritually influential authors. Judy has a B.Ed in Religious Studies with an extensive knowledge of world religions and mythology, and an M.A. in Cultural Astronomy and Astrology from Bath Spa University.Taken from Earth Blessings by Judy Hall © Watkins Publishing, 2014.